I used to look at game jams and think: “Why would I want to put myself through that? Making a game in a day? A week? Whatever? Sounds exhausting.” I’ve changed my mind, and there are a few reasons. They allow you to gain experience and feel pressure in a unique setting, they demand creativity and problem-solving in a short amount of time, and they allow you to participate in one of the coolest communities on the planet. Don’t know it? Learn it! As a producer, I’ve seen amazing things happen on the teams I’ve led. 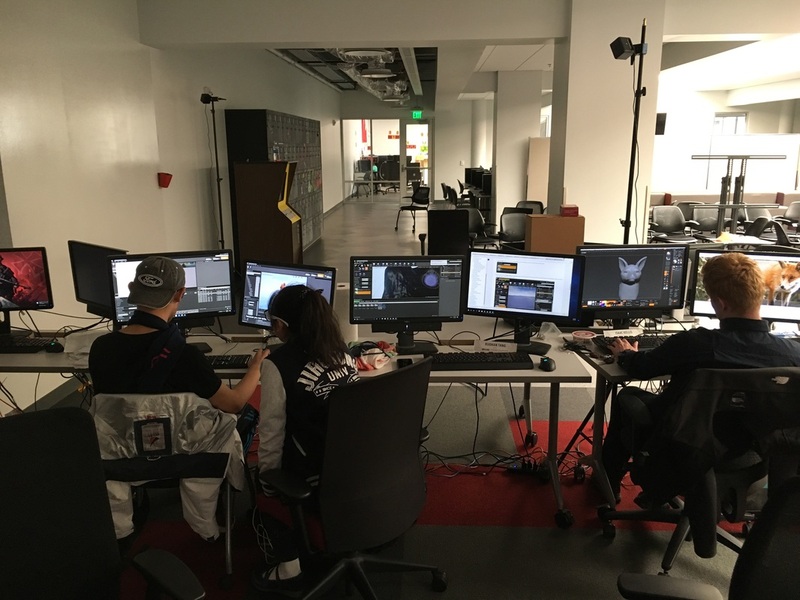 Game jams offer the opportunity to learn new tools quickly. How? Well, when there’s no time to waste, human beings can pick things up really fast. I recently led a team through Epic Games’ Mega Jam. It’s about a week long, and they give you a theme and certain requirements you must meet. The team consisted of myself and four other developers. One of the engineers I worked with was brand new to Unreal Engine 4, the engine we were required to use. Since we were on such a tight schedule with a deadline approaching, he took major initiative and watched YouTube tutorials. LOTS of them. As a result of this, he had figured out blueprints and some of the other features unique to Unreal over the course of a day or two. His desire to learn helped him achieve great things, and I strongly believe the jam created that environment for him. Now he has valuable skills, and he made a game with them already! ​My artists also sunk their teeth into new things. I had two tech artists on the team, both of which were enthusiastic about practicing skills they were eager to add to their portfolios. One jumped into shaders and textures, and also got involved with the level design. The other rapidly knocked out models for our character, enemies, and some environmental objects. Their passion helped create a healthy team dynamic as well, even over the course of a few days! Moral of the story is that pressure like this can be healthy for people. Team members can come out of these experiences with valuable skills, even when failures occur throughout the process. We originally decided on a multiplayer scenario between two players. And we got started. 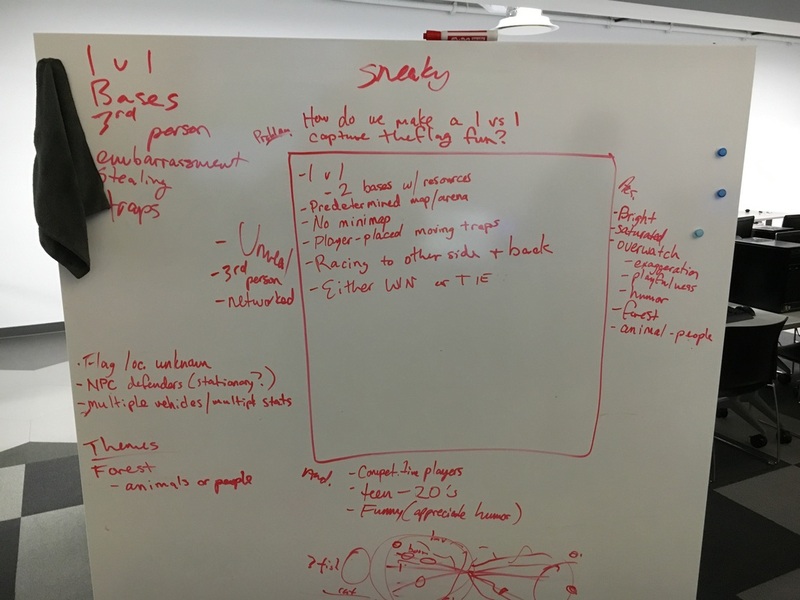 Three days in, however, our engineers learned that a networking feature would be too ambitious for the scope of the game jam. So we had to quickly problem-solve as a team, and revisit our creative process. ​Within an hour, we had revamped our design to fit a single-player experience. We didn’t want to go single-player, but it’s what we had to do. Results were more important than our individual opinions or ideas. And what we created is actually pretty fun! We ended up with a core game loop that someone could start, finish, and restart. We also had to revisit the level design as a result of this so it fit a single-player experience. We survived, too! Everything was OK! The idea here is that the team needs to problem-solve both as a group and as individuals. Early draft of our "design box"
Game jams are a phenomenon, honestly. I’ve heard glory stories of devs creating a game on a train ride to GDC. Friendships develop, crazy ideas come to fruition, and people grow together rapidly. I think that’s more important than some may realize. In a way, game developers are part of a huge family. We all have similar struggles. It’s a fickle industry. It’s unstable. These events help us grow together, learn from each other, and even network! They’re not wasteful. On the contrary. Game jams are in fact game development! I’m convinced that more good than bad comes from a game jam, except maybe sleep deprivation and some frustration along the way. At least that’s my opinion. I’m glad I did this one. It feels good to get results in such a short amount of time. Why not give it a try, at least? Okay, let’s get to the elephant in the room. I’m late to the party with Downwell. But here’s the way I see it - maybe there’s someone out there like me who has a huge backlog of games. And maybe that someone might appreciate an opinion on this game before they play it? That person out there - I’m writing for you! Downwell was a definite surprise for me. I picked it up this past weekend during a PlayStation sale. I’ve done some thought collecting about what makes it a thoroughly enjoyable game. It’s got a solid core. It has relevant juiciness. But it also has a couple things I would have done differently. 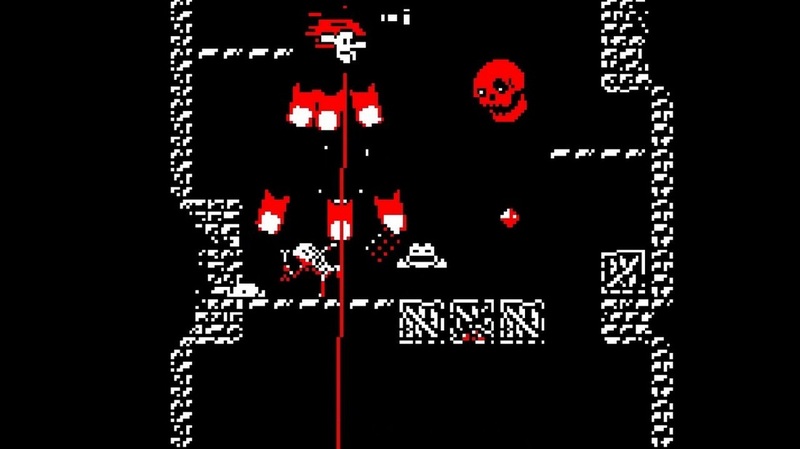 Downwell is a definite Indie title. When I say that, I mean it does a pretty good job at getting straight to mechanics without any fancy extras getting in the way. Those mechanics are what make it so addicting! There are a few verbs in this one: fall, jump, shoot, reload, move (side to side). At least those are the main mechanics.I noticed Downwell because it does things differently. It’s a roguelike. It’s a shooter. But you’re always falling. That nuance makes it different enough to give it a whirl. The gameplay is chaotic enough, but it also has refreshing opportunities to pause. Platforms abound, but players are subtly encouraged to move quickly and spend little time on them. You shoot enemies by doing a sort of double jump, but you can also jump on their heads, a la Super Mario Bros. You have a life bar. You have to reload. Some enemies are only shootable. Some are only jumpable. Don’t lose all your life, don’t spend too long between action instances, and successfully reach the bottom of the level so you can move on. That’s really it! And it’s damn near perfect at its core. If you gamers/devs out there haven’t yet watched this talk, I highly recommend it: https://www.youtube.com/watch?v=Fy0aCDmgnxg. The basic idea is that “juice” can make a video game great. But, we should always remember that the core needs to be there first (don’t start a game with the juice). Enough of that, though! 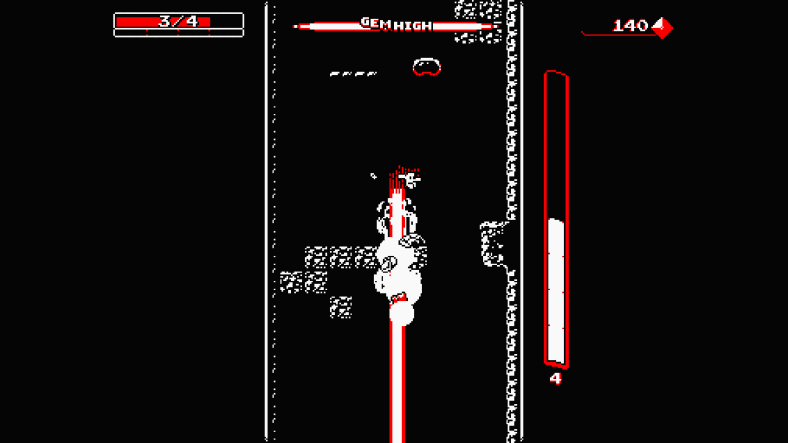 How does Downwell “juice it?” Very well, I’d say. Powerups are cliche, yes. But they feel so right in Downwell. Players have a few ways to obtain perks, or powerups. After passing a level, and through little side rooms along the way to the finish. Among the perks are gun types, extra life points, and other augmentations to your combat success. These add so much meat to the game. And they’re done in an unintrusive way so none of the core mechanics are polluted. I found myself playing the game for the powerups, knowing that I could accomplish cooler feats with them. Other examples of juice are aesthetic/cosmetic. Since the overall aesthetic is a 8-bit/retro one, these fit nicely! Players are rewarded with “palettes” and “styles.” Palettes simply change the filter of the game (gameboy, aqua, etc.). Styles are silly, but still fun. They’re basically different ways your little character can move around. Neither of these affect gameplay, and are simply rewards for consistent successes and time spent playing the game. I wouldn’t change much, to be honest. I actually think the world needs more games as simple and catchy as this one. That being said, there are a few issues of clarity. Some of the palettes make it difficult to see enemy/platform types. I know I said earlier that those rewards don’t change gameplay, but if players have a hard time identifying key components on the screen, they might affect it after all. Secondly, certain powerups refer to things in the play space that aren’t necessarily clear. For example, one powerup said I would gain health from corpses. I figured that meant enemy corpses, but there are also what look like dead things throughout the level. I’m still not sure which the developer is referring to. These things are minor, but can be annoying if they break the flow in any way. Play this game. It’s good. Real good. And it’s on multiple platforms. And it’s super affordable. This game caught me off guard, and I haven’t been able to put it down. Bravo, I say! And more, please!! People who dream big have a starring role in game development. They’re largely the reason we have originality and newness in games. They’re one of the reasons we have outliers--games that people talk about for years because they’re so different. They’re one of the reasons we have diversity in genre, mechanics, and aesthetics. But working with dreamers presents challenges. Keep in mind that the challenges I’m going to discuss by no means originate exclusively from dreamers. They can come from anyone on a team. I’m simply saying that I’ve seen these issues come up a lot in most teams because most teams have at least one dreamer. Games are born from creativity, from new ideas that should flow easily in any game development process. But is there a wrong time during development to entertain or implement ideas? I would argue yes. Brainstorming is critical for a game and should be a safe place for generating new ideas. Teams should use any sort of inspiration/prompt they like in this process: drawing, toying with legos, or mocking something up with paper. But there is a point when teams need to sift through these ideas, choose a direction, and settle on core features for their game. Team members frequently fall into a trap of dreaming up ideas later in development, when features should be locked down. Sometimes team members will abruptly bring up new ideas that they’ve put a lot of thought into. What happens next can make or break a game. If the team adopts the new addition to their planned feature set but haven’t scoped for that kind of feature in the game, this can be the beginning of a downward spiral. Tagging on extra features can quickly become a bad habit, pulling the vision of the game in different directions and throwing off momentum. The biggest danger is the distortion of core verbs/mechanics in the game design. In other words, more isn’t always better. Dreamers are the biggest culprits of this kind of behavior. They tend to take a lot of ownership of their game ideas, so they 1) constantly think of “more” that will make their design “better,” and 2) have a hard time killing their ideas off for the greater good of the project. Again, new ideas aren’t bad. But restriction is necessary for a healthy development process. You get the point. The employer is in a dreamer role here, and his additions to the original plan threw off the project completely. ​No matter how cool a dreamer’s ideas are, if the ideas are proposed at an inopportune time during development, a team should carefully evaluate their addition. Before adopting a new idea, a team should focus on core mechanics and structures and strategically consider scope, milestones, and the backlog. Add-ons can cripple a project. If you want more, make sure that you have the important stuff done first that you have the time to spend. Let the dreamers dream, but for the good of the team and the project, don’t be afraid to say no. In the past year or so, I’ve gained a lot of respect for mobile games from a design perspective. The Dots games have especially stood out. For me, and I’m sure many others, mobile games play a very specific role. If I’m on public transit, waiting for a meeting to start, or just wanting some wind-down time at the end of the day, mobile games are quick and engaging forms of entertainment and mental stimulation. If they’re done well, that is. And what makes or breaks a mobile game? One word: mechanics. That’s where Dots & Co. stands out, along with its predecessors. When I download a mobile game, I expect to hit a sense of flow within 30 seconds to a minute. Many games fail at this. Not Dots & Co. Mechanically, the game is a simple iteration off of the games that were developed before it (Dots and Two Dots). However, the NYC developers succeeded with this installment because they did game dev right. They iterated on previously successful mechanics. The basic mechanic for Dots & Co. is beautifully simple. You connect similarly colored dots to each other to destroy them. That’s it. And humans (not just gamers) love that kind of thing! We know “connect the dots” from everyday speech, and in a way, this game is as easy to understand as that expression. I can’t stress enough how important it is to nail down an engaging mechanic and then develop your game off of that, especially for indie or mobile projects. It’s good for the game’s development process, and it’s good for the consumers. Like its sister games, Dots & Co. features different and more exciting ways to destroy dots in the play space. Players can form squares, which destroys all dots of that color on the board. Players can form large squares surrounding a different-colored dot, which also leads to additional destruction of dots. Basically, it’s a lot of dot elimination. And it feels so good. Simplicity + flow state for the gamer = successful game design. Obviously you can’t just rinse and repeat and get away with it forever. And Dots Inc. clearly acknowledged that with this game, as well as Two Dots. When you develop a game based off of something else, one should always ask the question: “How is this different?” Dots & Co. succeeds in this department. The “new” in this game is the “co.” part of the title. As part of the level progression, players gain special companions which have special abilities. An interesting facet of this gameplay element is that the companions will passively use their abilities. The catch here is that the player has to destroy certain dots that will power up their companions. This restriction balances the gameplay, allowing the player to do most of the work, and pleasantly surprises them when their companion executing their ability. The strongest criticism I have with this game is a small one, especially taking into consideration the fact that it’s a mobile game. I don’t really care about my companions. As I’m playing, I see extra dots being detonated (or otherwise disposed of), and I don’t think much of it, other than “I’m getting closer to clearing the level.” Perhaps this is what the game designers intended. But for me, the companions don’t mean much. In a way, they are just an extension of the abilities already given to the player (that can be refreshed through microtransactions). That being said, I haven’t played through 100 levels like my wife (a true addict of all Dots games). I realize the companions play a bigger role as the levels get more complicated. But early impressions are everything in mobile games, and that issue with the companions was one of my first thoughts. It’s common for me to download a mobile game, play it for 30 seconds, and uninstall it. This game is designed in such a way that it prevents me from doing that. The immediate engagement that comes through the simple mechanics is astounding, and is a textbook example of how mobile games should be designed. Dots & Co. is entertaining and addicting. It’s also excellent at allowing the player to teach themselves additional features as they go along. I applaud Dots Inc. on this project, and look forward to seeing more from them in the near future! Growing up, my brother and I would get either the latest Jak and Daxter game or - you guessed it - Ratchet and Clank. I can’t even begin to express how much fun we had with these games. I’ve had a hard time keeping up with some of the PS3 installments in the franchise, but I told myself I would absolutely see what they did with their 2016 game on PS4. And what can I say? I was not disappointed. 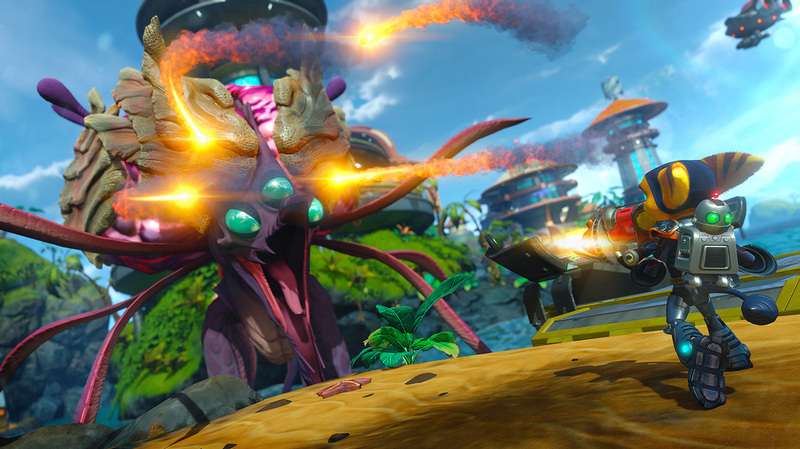 In this review, I’ll focus on the three things that reminded me why R&C games are so great. Flow, engaging upgrades, and strong aesthetic choices. Like any good 3D platformer, Ratchet and Clank immerses the player without the player really noticing they’re being...immersed… From the first scene of actual gameplay, I felt at home. Granted, a lot of this is the natural connection between the controller inputs and the game. However, I felt immediately engaged. How did the designers do this? Well, I think a lot of it is level design. Insomniac is no stranger to what good design is. The initial scene where Ratchet leaves the hangar puts you in a lush environment. Firstly, the player is allowed to explore and get their bearings, if necessary. That’s something the game brought back from its predecessors. In addition to an allowance for exploration, players are guided at the same time to the string of objectives they will face. This initial scene is a perfect example, because it’s where players are trained (without realizing it, necessarily). 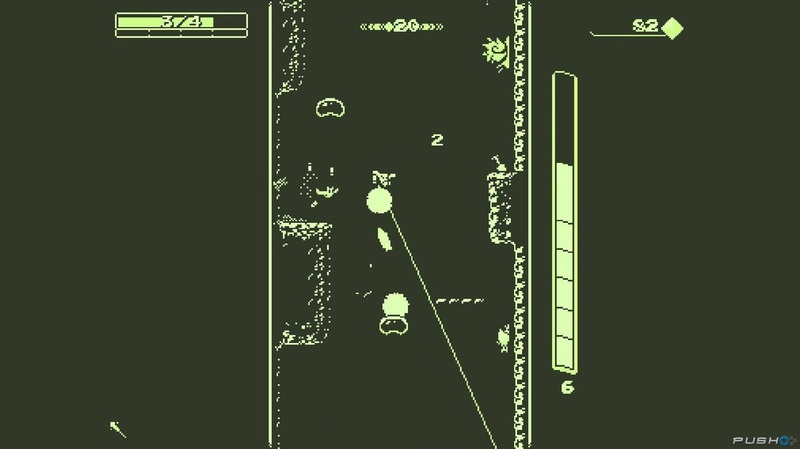 By following the path, players find their first weapon, and are presented with enemies and objects that are easily interacted with and attacked. And boom! That’s pretty much it! Rinse and repeat. Throughout the game, players are subtly guided through the levels through environmental and visual cues. If new gadgets are introduced, the same process is used. A simple demonstration, followed by more complicated opportunities for interaction. Because Insomniac’s designers use this ​process so well, players are immersed and don’t realize that they’re comfortably playing the game. Flow. It’s that important. This game helped me realize again how important level design is in terms of flow, and I can’t wait to replay it to analyze this further. Ratchet and Clank games would not be successful if they didn’t have rockin’ upgrades for weapons. And this game doesn’t slack off in that department. Using a unique visualization system, the game allows players to buff their weapons as they wish. Except the buffing is accompanied by an option/incentive to qualify for mystery upgrades within the upgrade map. As players get enough currency to upgrade weapons, they can potentially encircle unknown upgrades in the layout. When an upgrade is successfully surrounded, that weapon acquires the upgrade. This system works well, and differs from weapon to weapon. Some weapon upgrade tables require much more to surround a special upgrade. Others are easily gained. Although the idea of upgrading seems cliche in the games industry, it’s actually really important for Ratchet and Clank’s DNA. By giving players the chance to upgrade their weapons, the game offers players a chance to take ownership of Ratchet and his arsenal. That’s important because the story is otherwise linear. The variation offered through weapon-leveling is vital for the game, and also drastically increases the replay value. No Ratchet game has lacked in interesting aesthetic choices. That’s something this game has held on to. From the initial games in the franchise, I was blown away by the interesting use of color, the world-building, and the sense of humor. Insomniac was smart on this one, because they stayed true to the Ratchet roots. Humor plays a huge role in the aesthetic of the game - not just the dialog. If you look closely at each environment and enemy, players may notice that the world is alive through humor. Plants are curved in Suess-like ways, colors pop out in exaggerated levels, and enemy animations dance to the established humor of the world. This goes back to flow, because an effective aesthetic direction can make or break a player’s involvement in the game mentally. It’s extremely difficult to make sure all art assets maintain consistency throughout a project such as this, and Insomniac nails it. Although there is a wide spread of worlds and environments in the game, they all appear to have originated from the same creative pot. That’s how a studio should do it. Doing otherwise shows sloppiness and lack of attention to detail. This game really takes advantage of the age of HD, the capabilities of the PS4, and the many audio possibilities offered by current technology. The aesthetic is what sold the game for me, and I hope others can learn from this. PlayStation titles have always held a special place in my heart, and this game reawakened that appreciation. After hearing Insomniac CEO Ted Price speak at GDC about the journey of the studio, I gained even more respect for the studio and the franchise. Although the studio “...absolutely love[s] creating new IP,” I greatly appreciate their hard work on Ratchet and Clank. I look forward to seeing what they do in the future, both with this franchise, their current VR projects, and the new IP in the future. Well done, Insomniac. I salute you. ​​I'm a games lover, designer, and producer; Beatles freak; fishing enthusiast; and music researcher. It's tough to have so many good things in life!